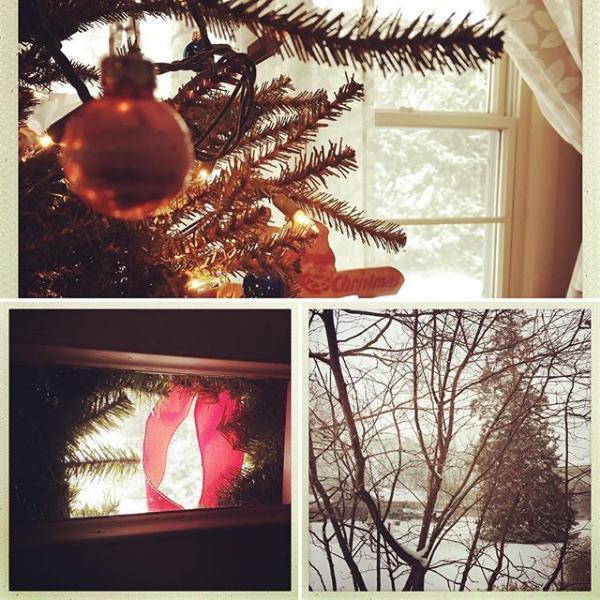 A pretty, quiet, snowy Christmas Eve goes a long way to help sooth the rancor of the past year—or at least it distracts in a very pleasing way. I'll repeat last year's Holiday cheer, as we need it now more than ever: Here's hoping that you and yours have a fun, relaxing, safe, and free-of-enmity Holiday season! The latest issue of Ugly Things features Sal Cincotta's piece on Total Crudd, an early 1970s, New Paltz, NY-based band. The article's everything that's great about rock and roll and everything that's great about Ugly Things. 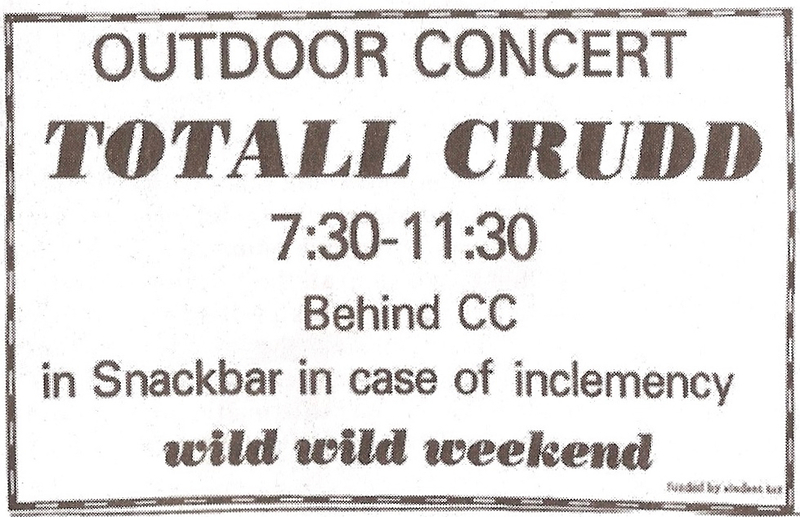 Total Crudd is most (in)famous for featuring Ross (soon to be "The Boss") Friedman, who left the band to join the Dictators. 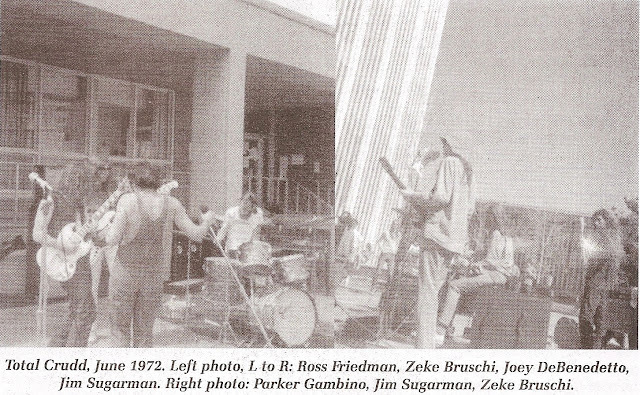 The band also featured Zeke Bruschi, Joey DeBenedetto, and Jim Sugerman, each of whom led interesting lives post-Crudd. 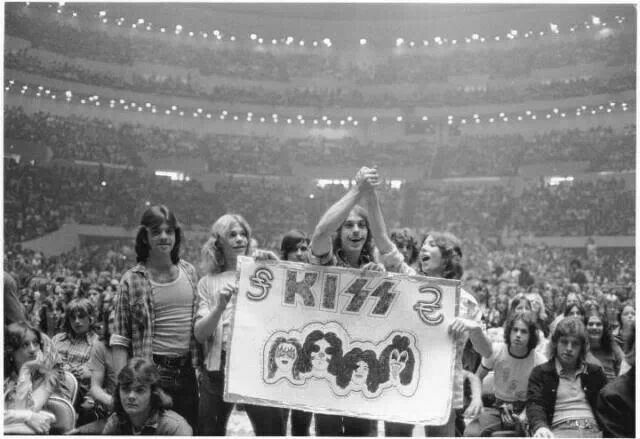 Cincotta rounded up the the members for a lively oral history, a must-read if you're interested in the era between the Sonics and the Ramones, when young diehard bands like Crudd kept the rock and roll flame going before heading into obscurity. The article's a blast, spiked with hilarious details that evoke the trashy, hungry early days of a ragtag rock and roll band inspired equally by blooze, parties, and misdemeanors, when everything was accomplished with a half-grin. "All the stories I tell you have been duly affected by legend and lots of drugs," Bruschi acknowledges, adding, "It happened at a time when events are very compressed in your life and it happens quickly, but is long-lasting. For those four years, we were thrown in together. Plus, we had the roots of coming out of the Bronx. The whole essence of Total Crudd was in the communal living. That's what made the magic happen. It was way more than just guys being in a band. It was how we lived." That's a Rock and Roll Manifesto, there. Fantastic. Do yourself a favor: buy the new UT (better yet, subscribe) and read this homage to a forgotten band, the likes of which is staggering hungover but hopeful to their next party/gig/party tonight, somewhere. “In the beginning it was just Lenny and I, and then we brought in a piano player, who was Richard Sohl,” Smith said in 2006. 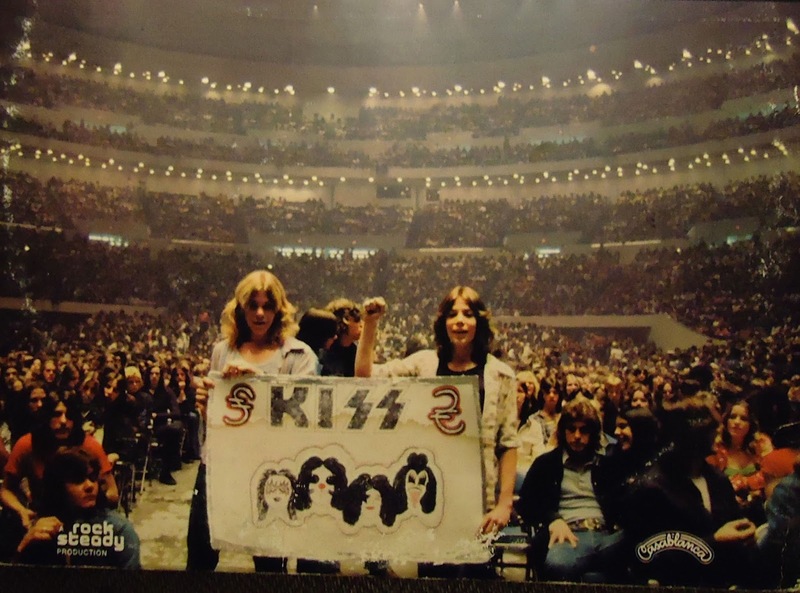 “So it was just the three of us… and we did very simple songs, because the configuration was so simple. We just chose songs that were basically three chords, so I could improvise over them.” She'd take the template of a two-minute, verse-verse-bridge-chorus song and stretch it until it accommodated, willingly or not, a surreal and poetic narrative. Rock and roll as prose poem, or the other way around, maybe. 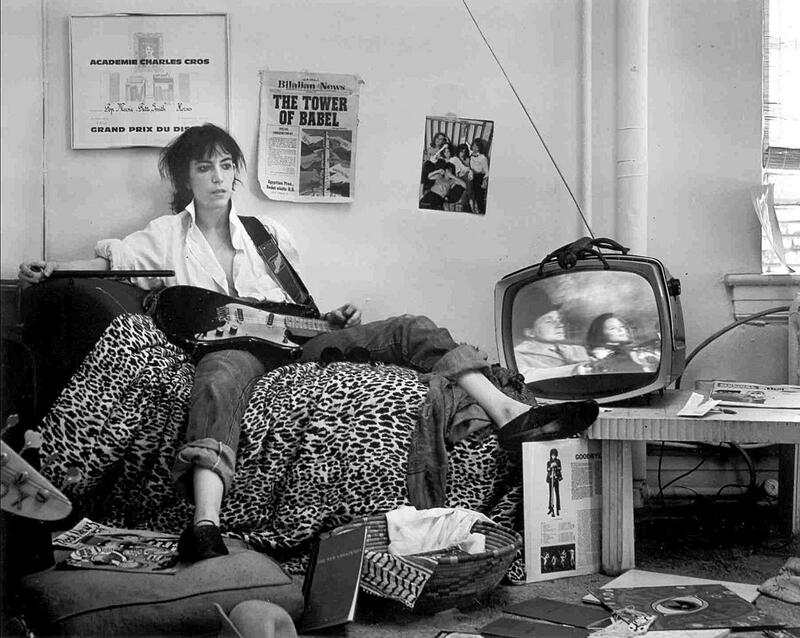 The mid-1970s Bowery rock and roll scene in which she was an early presence was pointed with contradictions, many of the early, epochal-making artists (Richard Hell, Television, Mink DeVille, Talking Heads, et al) turning radio rock and roll and pop music on its head in similar ways to Smith (who was joined on guitar by Lenny Kaye, who knew a thing or two about rock and roll forms). Sustainable subversion was the anthem of the day (and night). I'm always eager to read eye-level accounts of the liberating punk and street rock zeitgeist in lower Manhattan from this era, and Smith delivers in Just Kids. "We imagined ourselves as the Sons of Liberty with a mission to preserve, protect, and project the revolutionary spirit of rock and roll," she writes. We feared that the music which had given us sustenance was in danger of spiritual starvation. We feared it losing its sense of purpose, we feared it falling into fattened hands, we feared it ﬂoundering in a mire of spectacle, ﬁnance, and vapid technical complexity. We would call forth in our minds the image of Paul Revere, riding through the American night, petitioning the people to wake up, to take up arms. We too would take up arms, the arms of our generation, the electric guitar and the microphone. CBGB was the ideal place to sound a clarion call. It was a club on the street of the downtrodden that drew a strange breed who welcomed artists yet unsung. The only thing Hilly Krystal required from those who played there was to be new. From the dead of winter through the renewal of spring, we grappled and prevailed until we found our stride. As we played, the songs took on a life of their own, often reﬂecting the energy of the people, the atmosphere, our growing confidence, and events that occurred in our immediate terrain. I was sad to hear about the death of Pat DiNizio. I didn't know him personally, but I know many who did, and I'll leave to them a proper tribute to the man and the impact he had on friends and family. He wrote and sung terrific, sturdy songs with his band the Smithereens, yet another group that toiled in the heady alternate universe of my and so many others' rock and roll and pop tastes. I'll never forget hearing Especially For You when it came out; spinning it in the preview room at WMUC, my college radio station, the top of my head came off at the irresistible blend of melodies, hooks, and power. This is it, I thought. 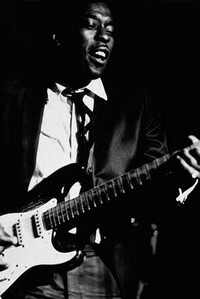 I played that album, and the band's next few, to death, and like so many other musicians of that era—Tommy Keene, Marshall Crenshaw, XTC, the Three O'Clock, et al—the Smithereens soundtracked the elating, confounding, confusing days of my twenties, scoring smash after smash in my interior Top 40. So-called conventional success was always beckoning, haughtily: Keene signed with Geffen; the Smithereens with Capitol. (Capitol! The Tower! The Beatles!) 1989's 11 is a phenomenal record, loud and tuneful. I remember reading at the time that DiNizio and the band, working with ace producer Ed Stasium, wanted to make a record that sounded as if AC/DC had married Meet The Beatles. What a concept. And it worked. I also recall a disconcerting flipside, as it were. 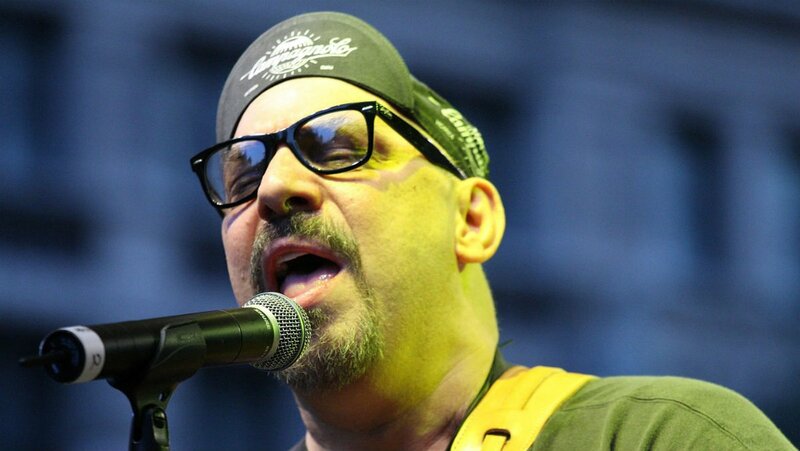 DiNizio had written the album's lead track and single, "A Girl Like You," for Cameron Crowe's Say Anything. Allegedly, DiNizio withheld the song following disagreements with the film's producer, who then substituted Peter Gabriel's "In Your Eyes" in its place. That iconic scene could've been linked forever to a DiNizio song—and how might that have affected his career, his band, his life? We'll never know, and the story's old, but it illustrates just how much luck—good and bad—and sticking to personal values play in mainstream success. I fell away form the Smithereens in the 90s and 00s. A bunch of years ago they played Cornfest, the music and food festival held in late August in downtown DeKalb, and I ran the few blocks into town to watch. They were great: tight, humorous, rocking, gently self-mocking. As happens in northern Illinois at the end of summer, a rainstorm blew in. The band was near the end of their set, just as they were playing a cover of the Beatles' "Rain." Perfect. These kind of modest, happy career moments I'll cherish, from the lucky outside looking in, as a band makes me smile because they're smiling because isn't rock and roll a trip? I made the case years ago that the Fleshtones are one of the great and criminally underrated rock and roll bands. I occasionally still feel the urge to testify. 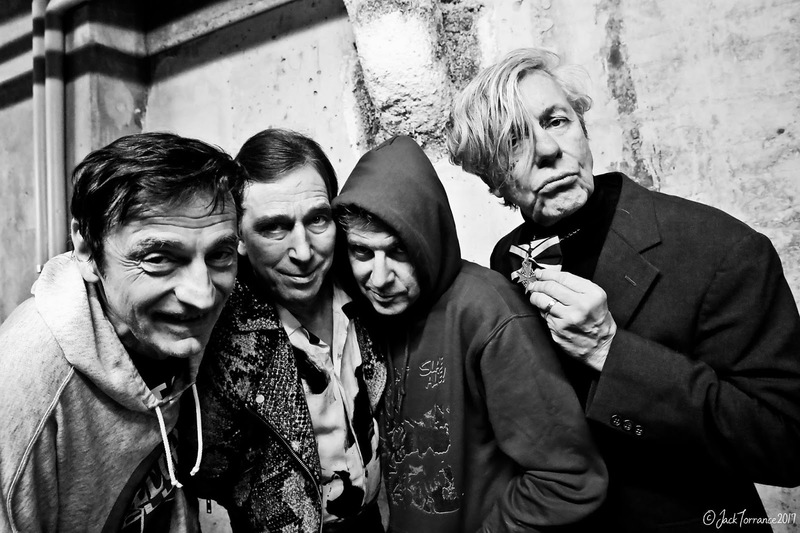 Last night at Le Taquin, a venue in Toulouse in southern France, the Fleshtones closed out a two-week, fifteen-city tour of Italy and France, two countries long enamored with Super Rock. 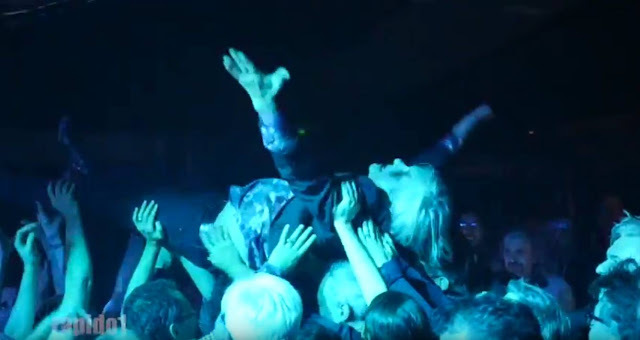 As the behemoth Rock and Roll Hall of Fame ™ trumpeted their Fan Vote ™, the Fleshtones played in front of small but intense crowds, packed into intimate clubs. The band debuted at CBGB in May of 1976 and have never had an inactive year, a claim very few, if any, American R&R bands can make. Above is sixty-three year-old Zaremba on top of the bar in Toulouse, leading a sold-out club singing along with "The Way I Feel"—the band's statement-of-purpose that they recorded with Marty Thau way back in 1978—seguing into a cover of the Yardbirds' "I Wish You Would." (Video below via boyissy.) 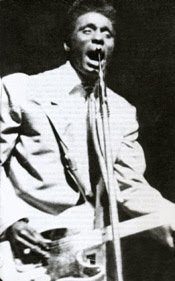 Zaremba eventually makes it back to the stage, but a bar top is as natural a place for him to be as any, as the Fleshtones have spent decades tearing down the wall between stage and fan. A shame that they can barely afford to play extended tours in their home country anymore. (American Beat, indeed.) Few bands match the Fleshtones in sheer endurance and energy. For that reason along I hope that they'll be appropriately feted someday. [T]he first Sunday of Advent, a new translation of the Our Father will come into force in all forms of liturgy. The Catholic faithful will no longer say: "Do not submit to temptation" but "Do not let us enter into temptation." This is a crucial difference, as Francis sees it. The Reverand Ian Paul, an Anglican theologian, demurs. "The word in question is peirasmos [from New Testament Greek] which means both to tempt and to be tested," he remarked to The Guardian. "So on one level the pope has a point. 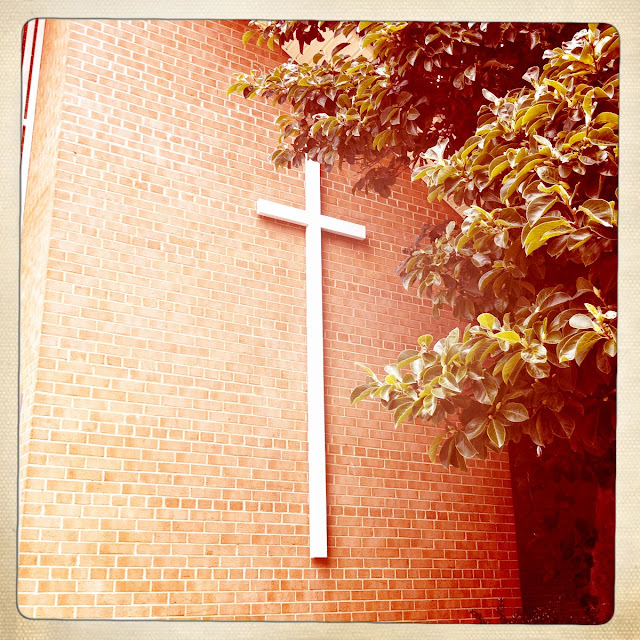 But he's also stepping into a theological debate about the nature of evil." Paul added: "In terms of church culture, people learn this prayer by heart as children. If you tweak the translation, you risk disrupting the pattern of communal prayer. You fiddle with it at your peril." I'm of two minds. I understand Francis's concern about syntax, that believers reciting the earlier line might be led to believe that God, rather than allowing us to be tempted, is doing the tempting Himself—behaving as a cruel father might, rather than as a wryly understanding one. But part of that line's charge for me came from my belief that God was leading me, or, at least, opening the door, beyond which lay.... And I had the option of following or not. That felt very much like the real world, to me, where, if I understood things correctly, God appeared manifold, everywhere and in everything, and in surprising, complex ways. In the new language, God feels slightly removed from the process, more divine and distant, elevated, not alongside me in and of the world where excesses of all kind beckon. I guess I'd always heard tough love in that tough line. Or maybe it's just that the new change upsets the poetry of the line, and, as Paul notes, would require me to accept after many, many years of recitation a fundamental change in cadence and music. If you were raised Catholic, the Lord's Prayer and the deep-tissue, hypnotic trance of its weekly- or daily-repeated language were as familiar as your siblings' names, as manifest as the breeze in the air. Yet there's not much at stake for me: I've long identified as an agnostic; I haven't regulalry attended church in decades. As a grumbling aesthete, perhaps, I'm most upset with the meddling of a formative adolescent memory, one in which I was tutored with realizing it in another lesson in the power of language to evoke and stir. Photo of Saint Andrew the Apostle Church in Silver Spring, Maryland, where I attended grade school and mass, and served as an altar boy.